The Clow 5 Way Aluminium Platform Ladder is an extremely versatile, lightweight multifunctional model with 5 positions in 1 portable package. Provides a maximum load of 150kg. The Clow 5 Way Aluminium Platform Ladder is an extremely versatile, lightweight multifunctional model with 5 positions in 1 portable package. 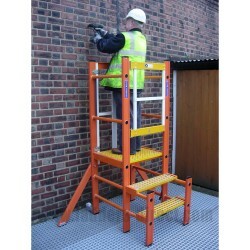 Combining a stepladder, extension ladder, single section ladders, a working platform and stair platform all in one product, the 5 Way is quick to set up, easy to use and offers a robust alternative to typical multifunction ladders. 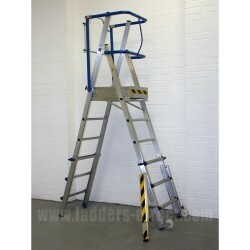 Including a large, slip-resistant working platform with wraparound platform brace hooks to secure. Rigid construction with wide base stabilisers and slip resistant feet offer enhanced stability, safety and security. This product is manufactured in compliance with previous EN131-1:2007+A1:2011, EN131-2:2010 and EN131-3:2007 specifications and provides a maximum load of 150kg. Please note these original specifications have now been withdrawn and superceded by EN131-1:2015,EN131-2:2010+A2:2017 and EN131-3:2018 specifications.